When it comes to opting for outdoor living features, homeowners often prefer an outdoor kitchen installation. This structure adds dimension to the property, increases the functionality of the yard and becomes the perfect place to relax with family and entertain guests in. 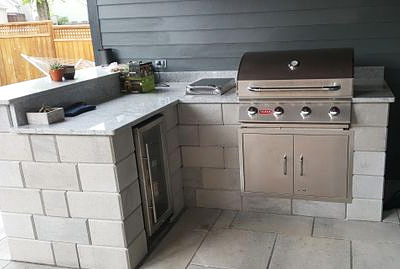 Many people like to get their outdoor kitchen built on their patio or deck, while some get the structure built in another area of their yard. We at Emerald Creek Landscapes, LLC are a well-established company in the landscaping field and have been serving customers in Ringgold, East Brainerd, and Fort Oglethorpe. Our experts have successfully completed a large number of outdoor kitchen design and installation projects across East Ridge, Dalton, Chattanooga and Red Bank as well. We have also catered to customers in Middle Valley, Cleveland, Soddy-Daisy, Calhoun and the surrounding areas and created beautiful exterior kitchens on their properties. Location and Size - As mentioned earlier, the location of the kitchen is important. If you want this feature built on your patio or deck we make sure that every aspect of it complements the indoor areas of your home. This is because the interior living spaces flow into the outdoor kitchen space and it becomes vital to maintain the design and movement flow in these areas. The size of the feature has to be chosen with care too and needs to be proportionate to the dimensions of the yard as well as the house structure. Installations and Storage - We take into account all the appliances and installations you want there and ensure there is plenty of space for your stove, BBQ grill, refrigerator etc. The countertops will be built using weather-resistant materials and we will also plan the storage smartly. Plumbing and Drainage - The water and gas plumbing lines will be planned well and we will make sure that the drainage system is installed well. Outdoor Lighting - The outdoor kitchen lighting needs to be planned well too. We make sure that there is task lighting above the counters and recessed lighting in the other areas. This allows you to create the right mood in the space. Aside from all these things, we can also design and install water features and fire features in your outdoor kitchen if you like. We use weather-resistant materials in the work and high grade pavers for the flooring. This helps ensure the feature will be able to withstand regular wear and tear well and last for a number of years without any trouble. With the vast experience and expertise we have developed over the years, we know what it takes to provide excellent solutions at very competitive outdoor kitchen cost. For any more information on our services or to discuss your project details, feel free to call Emerald Creek Landscapes, LLC at 423-593-5443. You can also send us your queries and project details via this online form.